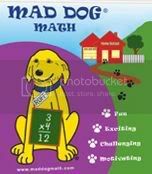 Mad Dog Math is a computer math program designed to help your child learn their math facts. The Practice Drill Software is designed for Windows computers. The program progresses through addition, subtraction, multiplication, and division. Parents/teachers set the time allowed and the fact family to be practiced. It actually originated as a paper program, and it is also available in that version. 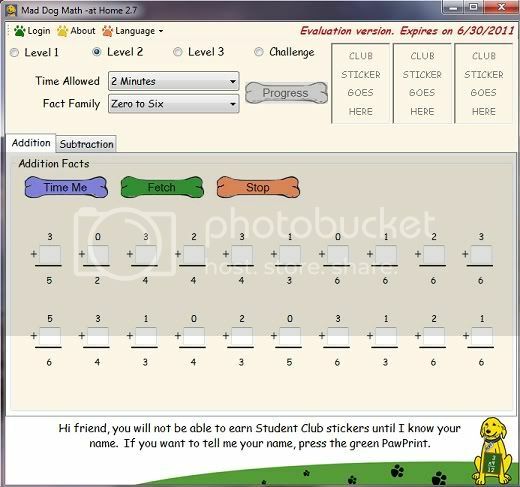 The child's computer screen appears as the example below. If the child is signed in, their progress is tracked and they are rewarded with recognition as they progress through levels. My son (completing first grade) enjoys the challenge of trying to complete the problems before his time runs out. The program is very adaptable; you can even choose "no limit" when selecting time allowed for your student. My 6th grader called it "fun" and said that she enjoyed working through the different "clubs." From the vendor: "I am hoping that each family uses the software each day for at least 10 minutes, 5 days a week. Once children pass one family, they move to the next. Once they pass one club, they go to the next. As a teacher or home school parent, I would use one level for the entire school year. It is not something to do for 6 weeks and then put aside and think the job is finished. It is the continual drill and repetition daily that will solidify the facts into a child’s mind. They learn just like we learn. Then, children need to be given opportunity to use the facts that they have learned on their daily math page." I’m not a techie, however after following precise instructions for the download it was successful. As a member of the TOS Homeschool Review Crew our family was given a 12 week trial of this program for the purpose of this review. Check out the website for a free trial. A one-year download is available for $19.99, and other options are available. See what other crew members reviewed here.